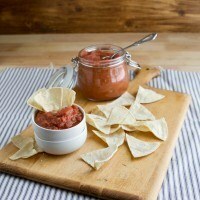 Savory Rhubarb Salsa with Chipotle | Naturally.Savory Rhubarb Salsa with Chipotle | Naturally. Heat a large pot over medium heat, add olive oil. Stir in onions and sauté until the onions become translucent, 4 to 5 minutes. Stir in rhubarb and continue to cook until rhubarb softens , time varies depending on if you are using fresh or frozen. Next, add remaining ingredients. I start with 1/2 teaspoon of chipotle and taste at the end to see if I want more heat. Stir and bring salsa to a boil, then reduce to a simmer. Let cook for 15-20 minutes. If you want smoother salsa, use an immersion blender (or a regular one) to puree. Taste and adjust seasonings as desired. Serve warm or store in refrigerator for up to a week. This salsa sits on the tart/spicy side. You may need to adjust the brown sugar- this recipe is very forgiving in that nothing really needs to be exact.